It’s Disco Deals/Group Gift/Gatcha time at Dark Mouse! Hi my friends, I am participating in Disco Deals this month, and I encourage you to stop by and check out all the bargains from some really great designers! 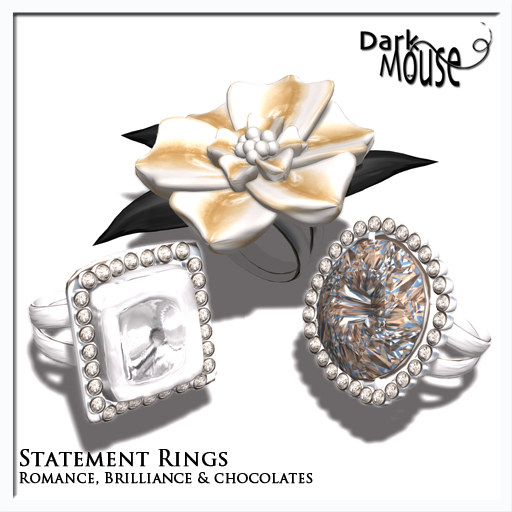 I will be releasing my ‘statement’ rings for the event, at the special ‘event’ low price of $99L for all three rings. Don’t miss it! Here’s a teleport to Disco Deals. Other great designers at this months Disco Deals are Karizmatik Modern, Clique, Shania’s Sock Shop, Miao, Terho (formerly Lazy Spaces), Projekt Mayhem, Moonshine, Dragon Charm Designs and !bang. Also, don’t miss out on my great group gift the Pearls Forever necklace – if you join now, you’ll receive it on April 1. 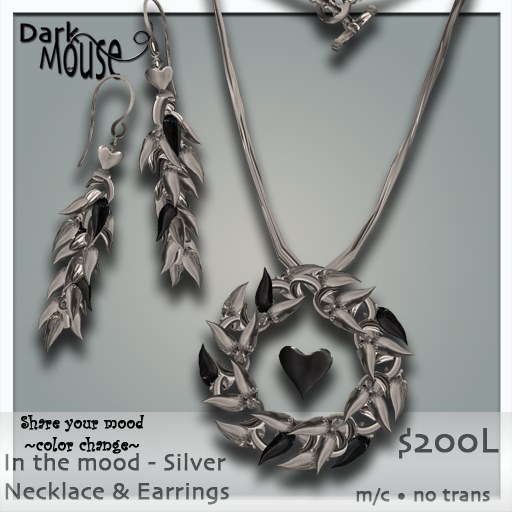 If you join after April 1, you’ll find the necklace in notices for however long notices last ;-). You can see pictures of the necklace on my last post. 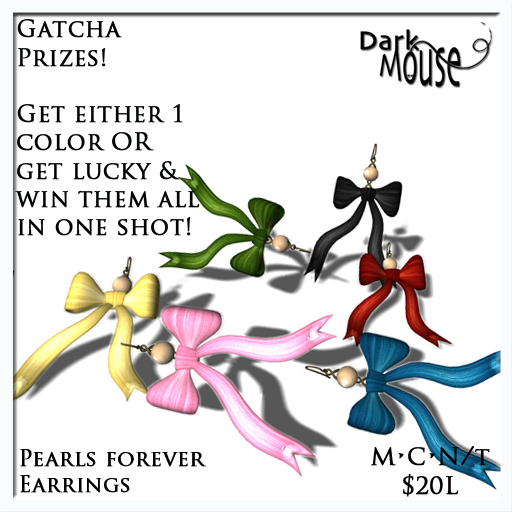 I also made earrings to match this fun necklace – and put them in my NEW Gatcha machine – $20L, you definitely get one color, but why not try for all colors – OR – the fat pack? I’ve made these earrings transferable so you can trade them with your friends! I plan to have 3 gatcha machines in the store, eventually! Here’s a teleport to Dark Mouse. 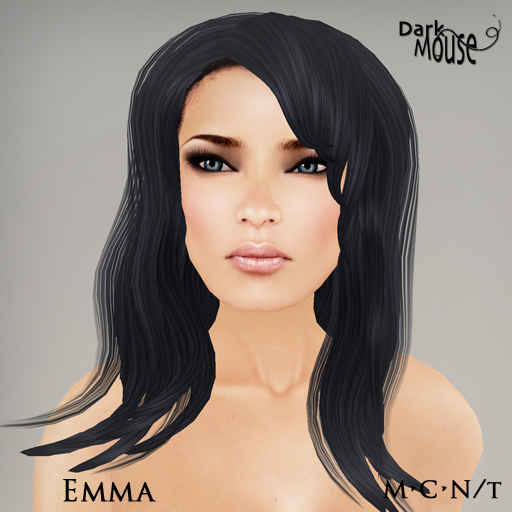 Dark Mouse Hair at Disco Deals! Hi my friends – I have hair for this months Disco Deals, I do hope you like it. I have Emma and Emma 2.0 – demo’s available. Please stop by Disco Deals this month and check out all the great vendors! You can check out all the vendors on the SCD blog, they will be posted Friday morning. 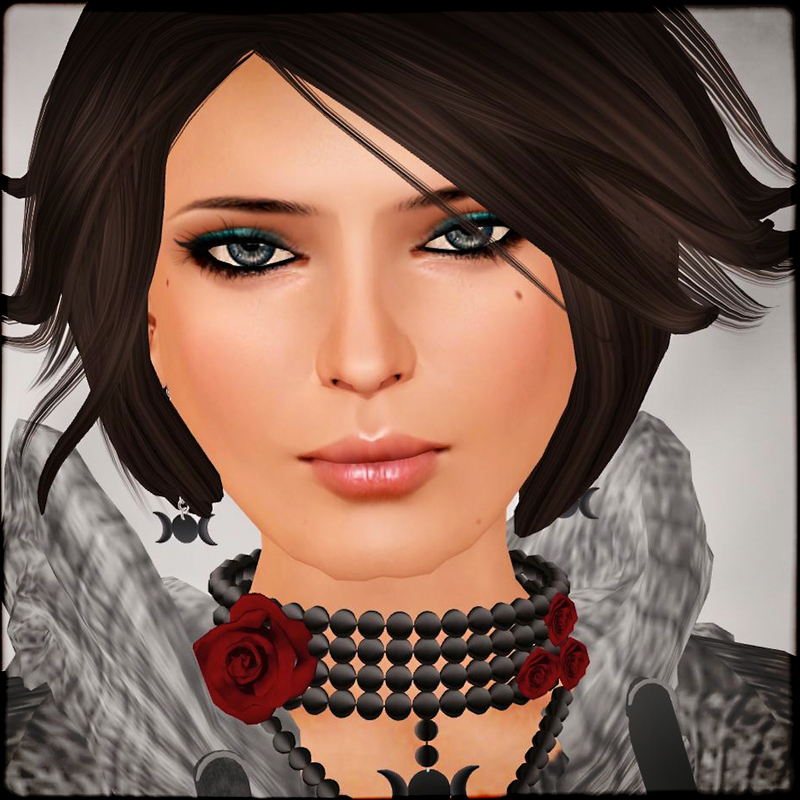 This months vendors are Abode, Clique, Dark Mouse Jewelry & Hair, Gesticulate!, HopScotch, Ingenue, Karizmatik Modern, Lolapop!, Miao, Mood, Projekt Mayhem, sur+ and Wretched Dollies. Here’s a teleport to the event! And here’s pictures of my two new hairstyles! Sometimes it bothers me a lot that I don’t have more time to spend on SL. Then other times I’m grateful that I don’t have more time to spend on SL. In any case, I’ve not been spending a lot of time on SL. On the evenings that I’ve been unable to log in, I was diligently working on new hair textures for my less then thriving hair business…I wanted to improve my textures for two reasons – the first being to prove to myself that I’ve learned enough about photoshop over the last 3 years to actually produce something half way decent for SL, and the second being that I was unable to build hair with the old textures because I personally hated them so very much. Crazy heh? Anywho, I’ve finalized my textures and I now have 3 new styles in my shop – I hope sincerely that you like them. You’ll find Antonia – a style I created to go with a stunning ball gown, Rosario by Miao – soon to be released as a limited edition dress with jewelry I also made. Kate, a rework of an older style of mine that I’ve always liked. And finally Sabrina, a style that I like very, very much because it reminds me of one of my idols. Today, I was gifted (my secret santa came through! YAY!!!) with this stunning dress from Zaara, which has obviously been blogged before, but deserves all the adolation it gets. Awesome party dress for New Years, I think. I paired it with my killer GOS heels, because I love them so very much – and I heard there are more KILLER heels on the way (thank god for plurk heh?). Oh and last but not least – I have to call out the poses that I used in these photos – Clique by Iris Seale (thankies gogo). I have 3 and I think I need MORE please. Where is the store??? *prods* I really liked these poses and think we’ll be seeing great things from Clique. If you’re interested in any of my new hairs and textures, here’s a teleport to the shop, they are out on the third floor. I’ll be in my workshop, agonizing over making more.